This paper proposes a model-based 3D footstep planning method. A discrete-time kinematic model, in which vertical motions are independent of horizontal motions, describes the biped walking of the humanoid robot. The 3D field environment is represented by geographical features divided into the meshes, determined from measurements obtained by a sensor, where the inclinations in each mesh are assumed. The optimal plan is obtained by solving a constrained optimization problem based on the foot placements of the model. A goal-tracking evaluation of the problem on horizontal foot placements is carried out to reach the goal, while vertical motions are adopted to meet constraints consisting of the foot workspace and contact with the 3D field surface. A quadratic programming method is implemented to solve the problem based on the humanoid robot NAO in real time. 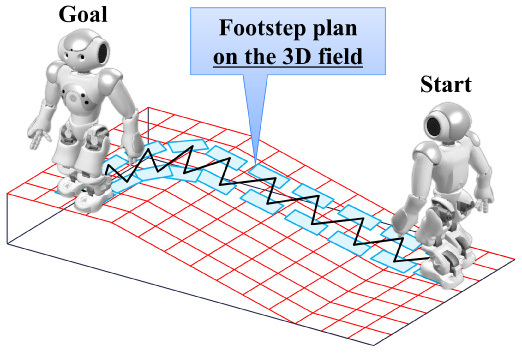 D. Kobayashi, T. Takubo, and A. Ueno, “Model-Based Footstep Planning Method for Biped Walking on 3D Field,” J. Robot. Mechatron., Vol.27, No.2, pp. 156-166, 2015. J. S. Hu, J. H. Cheng, and Y. J. Chang, “Spatial Trajectory Tracking Control of Omni-directional Wheeled Robot Using Optical Flow Sensor,’’ Proc. of IEEE Int. Conf. on Control Applications, pp. 1462-1467, 2007. E. Maalouf, M. Saad, and H. Saliah, “A Higher Level Path Tracking Controller for a Four-wheel Differentially Steered Mobile Robot,” Robotics and Autonomous Systems. 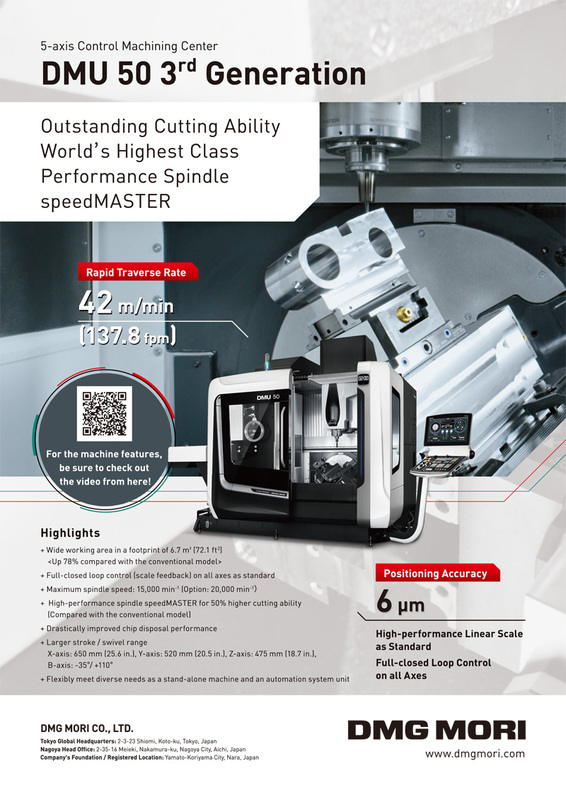 Vol.54, Issue 1, pp. 23-33, 2006. J. Kuffner, K. Nishiwaki, S. Kagami, M. Inaba, and H. Inoue, “Footstep Planning Among Obstacles for Biped Robots,” Proc. of IEEE/RSJ Int. Conf. on Intelligent Robots and Systems, Vol.1, pp. 500-505, 2001. R. Kurazume, T. Hasegawa, and K. Yoneda, “The Sway Compensation Trajectory for a Biped Robot,” Proc. of IEEE Int. Conf. on Robotics and Automation, Vol.1, pp. 925-931, 2003. K. Nishiwaki, S. Kagami, J. Kuffner, M. Inaba, and H. Inoue, “Online Humanoid Walking Control System and a Moving Goal Tracking Experiment,” Proc. of IEEE Int. Conf. on Robotics and Automation, Vol.1, pp. 911-916, 2003. H. Kobayashi and T. Sugihara, “Self-consistent Automatic Navigation of COM and Feet for Realtime Humanoid Robot Steering,” Proc. of IEEE/RSJ Int. Conf. on Intelligent Robots and Systems, pp. 3525-3530, 2009. J. Chestnutt, M. Lau, G. Cheung, J. Kuffner, J. Hodgins, and T. Kanade, “Footstep Planning for the Honda ASIMO Humanoid,” Proc. of IEEE Int. Conf. on Robotics and Automation, pp. 629-634, 2005. J. Garimort, A. Hornung, and M. Bennewitz, “Humanoid Navigation with Dynamic Footstep Plans,” Proc. of IEEE Int. Conf. on Robotics and Automation, pp. 3982-3987, 2011. W. Huang, J. Kim, and C. G. Atkeson, “Energy-based Optimal Step Planning for Humanoids,” Proc. of IEEE Int. Conf. on Robotics and Automation, pp. 3109-3114, 2013. O. Kanoun, E. Yoshida, and J.-P. Laumond, “An Optimization Formulation for Footsteps Planning,” Proc. of IEEE-RAS Int. Conf. on Humanoid Robots, pp. 202-207, 2009. O. Kanoun, J.-P. Laumond, and E. Yoshida, “Planning Foot Placements for a Humanoid Robot: A Problem of Inverse Kinematics,” Int. J. of Robotics Research, Vol.30, Issue 4, pp. 476-485, 2011. N. Yao, T. Takubo, K. Ohara, Y. Mae, and T. Arai, “Gait Planning for a Biped Robot by a Nonholonomic System with Difference Equation Constraints,” Proc. of IEEE/RSJ Int. Conf. on Intelligent Robots and Systems, pp. 4471-4476, 2010. D. Goldfarb and A. Idnani, “A Numerically Stable Dual Method for Solving Strictly Convex Quadratic Programs,” Mathematical Programming, Vol.27, Issue 1, pp. 1-33, 1983. J. M. Maciejowski, “Predictive Control with Constraints,” Prentice Hall, 2002. T. Sugihara, “Solvability-Unconcerned Inverse Kinematics by the Levenberg-Marquardt Method,” IEEE Trans. on Robotics, Vol.27, Issue 5, pp. 984-991, 2011.